Indeterminate. Regular leaf. 80 days. Bred by Mark McCaslin. Selected by Dean Slater of PKS Tomatoes. Excellent example of sweet to acid ratio. Fruits up to two pounds, here. 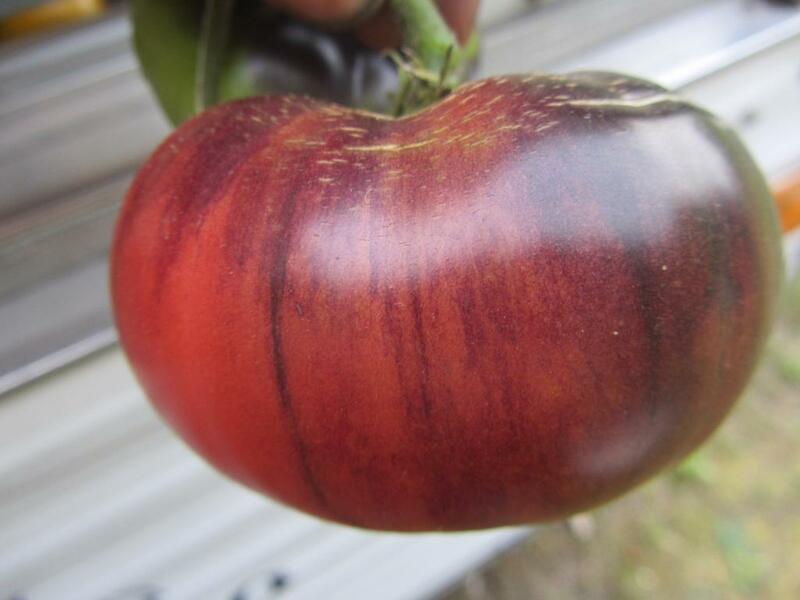 Dark hot pink beefsteaks with deep antho striping. Sibling line to Yellow Dragon and Rainbow Siberian. this variety is fantastic for both looks and flavor. Very productive and also shows good disease resistance. Grows well in cool or hot climates. A real winner! Indeterminate. Regular leaf. 80 days. Bred by Mark McCaslin. Selected by Dean Slater of PKS Tomatoes. Excellent example of sweet to acid ratio. Fruits up to two pounds, here. Dark hot pink beefsteaks with deep antho striping. Sibling line to Yellow Dragon and Rainbow Siberian. This variety is fantastic for both looks and flavor. Very productive and also shows good disease resistance. Grows well in cool or hot climates. A real winner! 20 seeds per pack.